I'm a big fan of the stay-cation. Chicago has so much for people to do, even locals who experience it year round. You can't be bored here, there's so many museums, restaurants, and even free attractions. (Feel free to hunt through my Chicago posts if you're ever in need of ideas. More to come soon!) And while I love to put these on my calendar for when I have some time off, I do occasionally want to skip the downtown atmosphere, since I work in it every day, and just stay home. That said, I try to make it a little more special than some random week night where we order take out and watch yet-another-why-can't-I-quit-you-HGTV episode of Property Brothers. We live for blankets in this house, I think. They're everywhere. Maybe that's because I like to keep the temperature at 65 or lower and other people need the blankets to get warm, but that is neither here nor there. Blankets are so nice for getting all bundled up and comfy during your stay-cation. They are also essential for fort building, which I highly recommend, at any age. All of our throw blankets are from Target, they have some of the best ones at decent prices. You've seen the plaid one on our couch upstairs. And we have this gray one on the couch downstairs that I've had for years and everyone loves. I'm not sure if it's the queen or king size, all I know is it's big! We also recently got this cream colored faux fur one and so far it's super warm and soft. Haven't washed it yet, so can't vouch for how it will hold up, but I'll try to report back soon. I have a problem with Bath and Body Works 3 wick candles. I cannot resist them. So if you're looking for recommendations for other kinds, I can't give you that. But I can tell you which Bath and Body Works ones to get! My all time favorite scent is Champagne Toast, followed by Peach Bellini. I love the peachy champagne scents, which, not coincidentally, is my favorite drink. 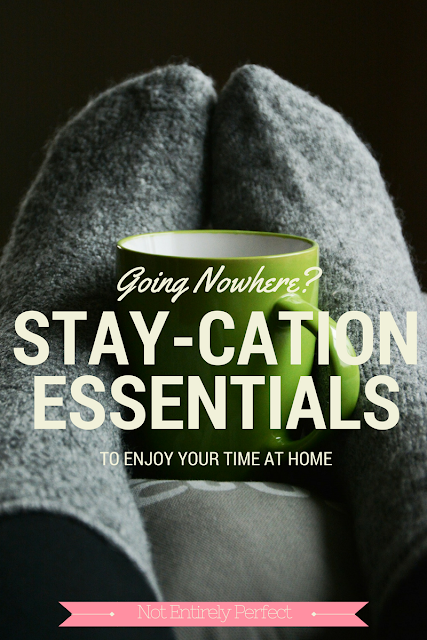 If your stay-cation is in the winter months (like now!) though, I think softer, warmer scents are in order. Try Smoked Vanilla, Mahogany Teakwood, Cinnamon Spice Vanilla, Flannel, and Marshmallow Fireside. Yes, I said 'and.' Not 'or.' I like to have all the options on hand! I'm actually not wildly picky about the type of coffee I'm drinking, but if you have any great recommendations, let me know in the comments. For tea, I just got the peach flavor from Adagio and it's amazing. Cinnamon apple flavors are also particularly cozy-feeling to me. As a kid, the go to for hot chocolate was Ovaltine, anyone else?! Now I like the super chocolatey (shocker) Ghirardelli options. And I have these mugs from Crate and Barrel, which I love because they're 'oversized' so I can make giant cups of coffee or hot chocolate and still have room for cream or marshmallows. I've had mine for years and they still look brand new. I think the real question here is whether or not you enjoy cooking. If you do, then try new recipes or make some favorites and spend your day in the kitchen. If it's not your thing, then there's no shame in ordering in! That's what GrubHub and Postmates is for. You can also stock up first on your favorite snack type foods, to hold you over until your pizza arrives. My favorites are pretty much all from Trader Joe's. They always have great crackers and dips (find 'pub cheese', seriously. And the creamy spinach artichoke dip.) plus tons of options in the freezer for little bite size things. Oo and the frozen croissants you let rise over night and bake in the morning. Yeah, just go to Trader Joe's. I enjoy reading for a true vacation feel, but sometimes I just want a good Netflix binge watching session. I try to get a ton of stuff saved to my list in anticipation of an extended at home vacation, so I have a lot to choose from based on my mood. If you need a recommendation, just ask! I'm happy to help. For the record, I'm currently working through Madame Secretary and The Glades, but of which I love. Stay-cations are a good time to put to use the pampering products you otherwise tuck away because they're impractical when you have limited time. If baths are your thing (they aren't mine), then now would be the time to pull out your Lush bath bombs you got for Christmas and haven't touched yet. I'm also pretty careful about what I put on my sensitive skin, but if you're dying to try a new face mask, bring that out too. Personally, I always use this time to paint my nails (I never seem to have time for that in my regular week!) I use the CND Vinylux weekly polishes that I mentioned in a Three on Thursday post a couple weeks ago. I generally run warm and can have the house pretty chilly before I'd need a sweatshirt or even just long sleeves. But I have to have socks on. I even wear them in summer when I'm inside. Cold feet make me very unhappy, very quickly. I like the thick wool knit ones, because they feel so much nicer than the socks you'd wear to work or for working out. And these are doggies, which I think is all I need to say about that. You can't have this one, sorry. 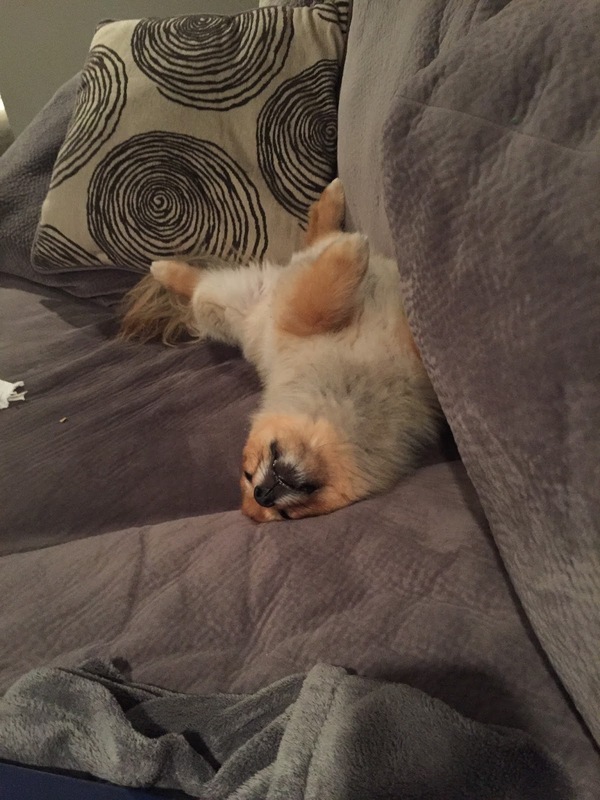 Insert your own fluff nugget here. 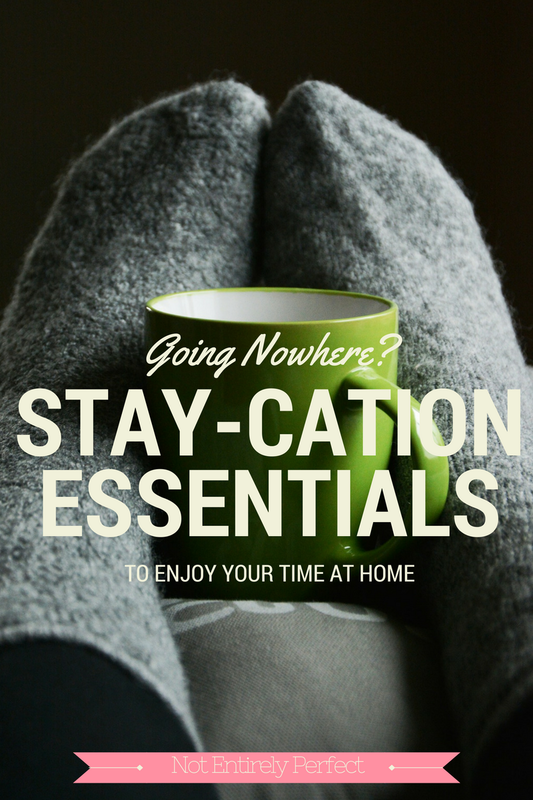 Which do you prefer - vacation or stay-cation? Any other stay-cation essentials I missed? Let me know in the comments!